We heat or cool our homes to keep our family comfortable. But, a single thermostat in the living room can’t always keep the upstairs cool or the basement warm. Fact is, you may feel a 12 to 15 degree difference in comfort levels within your own home. Heat from the sun can make one side of your home significantly hotter than the other side. What’s more, homes with large rooms or rooms with high ceilings can be very difficult to heat or cool. One thermostat in the typical home just can’t maintain suitable comfort levels throughout the entire home. But now there is a surprisingly simple way to make sure that every area of your home is comfortable – not just the room with the thermostat. Now you can lose the extra blankets, space heaters or fans and cut your energy bills at the same time! 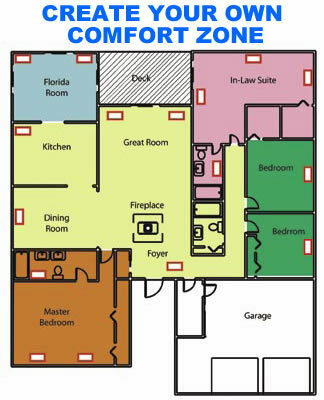 With the Arzel® Zoning System, you divide your home into separate comfort zones that make sense for your lifestyle. Each zone gets its own thermostat you set to whatever temperature you want for that zone. Our unique and patented damper system in your ductwork controls the flow of conditioned air and makes each zone a custom comfort zone. A zone can be just one room or several rooms. The choice is yours. You could make your kitchen its own zone or group it with your dining room and living room. You could give each of your bedrooms their own zone or group them together. It’s your choice…and that’s the beauty of zoning. You create just the right comfort pattern to keep your family comfortable throughout your home. Best of all, the installation process won’t disrupt your household. You see ordinary zoning systems often have to drill holes in your ceiling and walls to take your ductwork apart. That can get very costly and very messy. But the convenient Arzel® Zoning System uses your existing ductwork…just the way it is.